Pine nuts are something I always try to have in the house. Why? I love them and they add so much to a dish. Add it to a pasta dish for a wonderful flavor change. I also add it to pizza and veggies. Roast them a little in a pan before sprinkling on top of most dishes and it looks and tastes so much better. Just the other day, Daughter and I split a gluten-free pizza crust from Gluten Free Creations. What to put on mine? 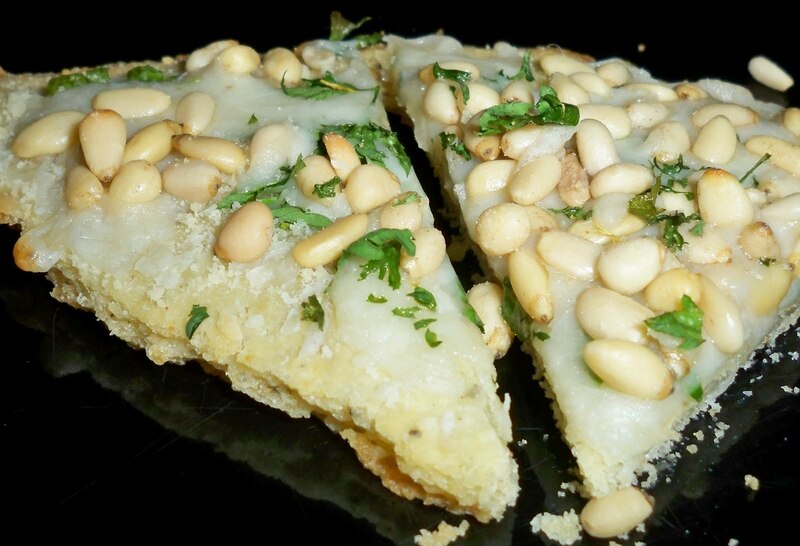 Aha, just a little parmesan, fresh parsley, sprinkle of mozzarella and a few pine nuts. Okay, a lot of pine nuts, I do love them so. You could probably use half as much and be happy with that. I pre-bake GF Creations pizza crusts for about 10 minutes so that the baking time is cut in half. After cheese and toppings are added, it only needs another 10-15 minutes for a crispy, yummy pizza. It’s a quick and yummy snack, and with the addition of the pine nuts, I feel as if I’ve made something gourmet and special. And hey, I deserve that and so do you, dear chef. This took all of five minutes to make, and it’s so yummy I can’t stop eating it -but I will ‘cuz I want to save some for later. Tomorrow is Thanksgiving, and cooking for yourself today is probably not high on your priority what with cooking for 20 tomorrow? I’m not cooking for everyone for the first time in 15 years and instead we’re taking veggies to my niece’s place for dinner. Yes, there’s a big turkey on the table (and a ham) but we’re bringing a Quorn roast for ourselves and there are plenty of veggies. But for today, it’s veggie time. We picked up our CSA bag and it was full of golden beets and rainbow chard-Yipee-my favorites. Every Wednesday is like Christmas as we open the bag and see what’s inside. I never keep the cilantro (I know, but I don’t like it) and I always keep the beets. So for lunch today, after splitting the goods with my BFF, I had 5 stalks of rainbow chard left and I went to town. Count it-five minutes. 1. Add chard to a large saute pan with olive oil (about a Tbs) and cook down. It will cook down to about half it’s size, just like spinach. 3. Add garlic to chard and stir. 4. 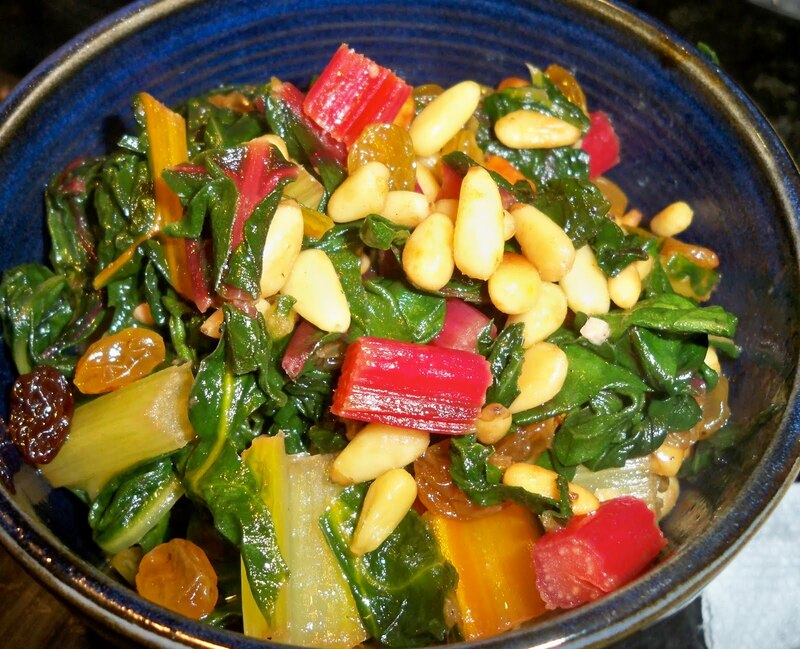 Add pine nuts, raisins and a pinch of salt to chard. Let cook for another minute. Voila! it’s done. I like to add a pinch of Romano cheese (grated) on top for a bite-but that’s optional. 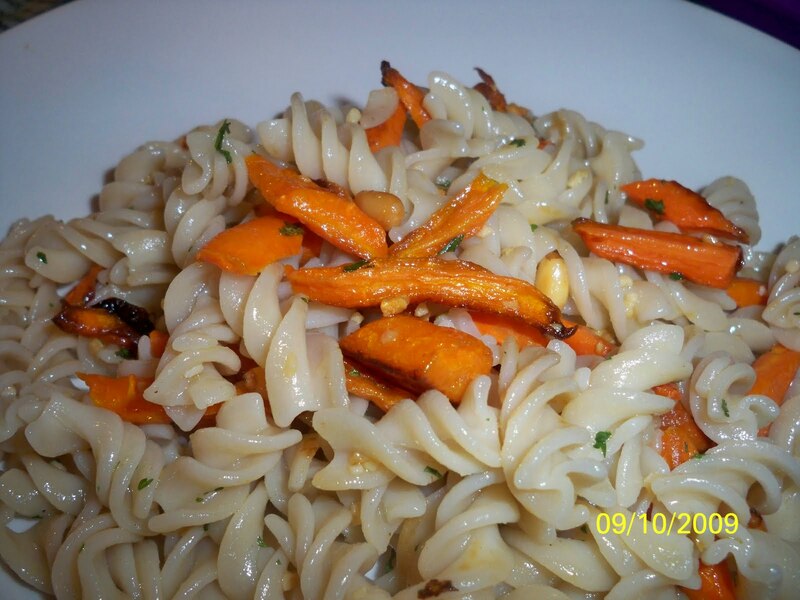 The pine nuts give his a great texture and flavor and the raisins add just a bit of sweetness. My favorite part is the crunchiness of the chard, it’s so refreshing and comforting. Dive in dear chef and have fun. Tomorrow you stuff yourself but today you can eat light and comforting.